It's the holiday season, and everywhere you turn, someone is trying to tell you what you should buy. 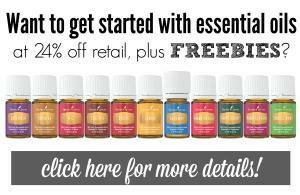 Gift Lists, Must-Haves, etc. are around every corner. But if you're like me, you want something . . .well. . .different. Know a guitar player? 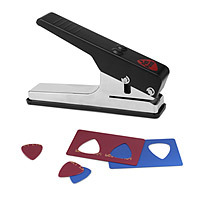 How about this Guitar Pick Punch? Is your BFF the consummate entertainer? 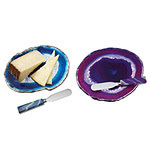 Give her these cheeseboards and slicers - they are pretty AND functional! How about that teen that just got her license . 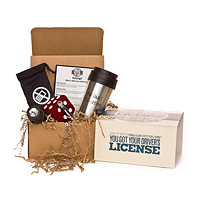 . . a Drivers License Kit just for her! I have been a fan of Uncommon Goods for years. I have always loved getting their catalog and pouring over the items they carried. It's definitely my go-to place for unique Christmas gift ideas. Now, I can go to their website, read their blog and peruse their catalog on my Google Catalog App. But no matter how I search, I can be sure that I will find something unique and just a little bit different, that suits my receiver's personality to a Tee. And they aren't just for Christmas! In fact, they are a great spot for cool gift ideas for ANY occasion! Forget that bottle of wine or flowers. And because I am such a fan, I get to offer one lucky reader the chance to win a $50 gift certificate to use at Uncommon Goods. (US Residents only) Just follow the instructions in the Rafflecopter and good luck! 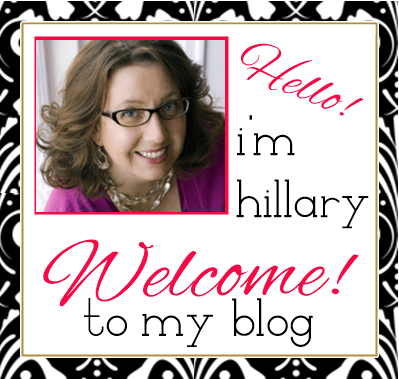 note - I received a gift card to be used on the Uncommon Goods website for writing this post; however, as always, all opinions are my very own. A 4 foot tall deer lawn ornament...when I was 21 and living in an apartment! Crystal candles from my future husband, the first Christmas together when we were young. I guess he saw style, grace, and opulence in our future together, lol! I got an olive oil mister one year...unique, but I loved it! A piece of coal from the Titanic. Uncommon Goods is amazing! It's one of my favorite catalogs to browse! I first heard about Uncommon Goods, when I received some great baby shower gifts a few years back... and I've loved the catalog ever since! Oh the guitar puncher is creative! My grandfather gave me a stuffed monkey in college with a note that said "hug a real monkey instead of those boys who want to monkey around." My most unique gift was coming home to my garden fully redesigned by all of my fabulous co-workers as a wedding gift - unique and one I can treasure forever!! I think maybe soap that looks like diced carrots and peas. The gift giver did not know that my mother used to say that we'd get peas and carrots for Christmas (instead of coal) if we weren't good. A Christmas ornament in June! Hmm... Most unique gift, I'd have to say a snuggie... I think they were re-gifted a lot when they first came out! My aunt made a really nice personalized needlepoint for us.